Our new shed is installed. The old one survived the storm, but with cold and wet weather likely to feature over the next few months, we decided that a shed large enough to sit out weather in was needed. 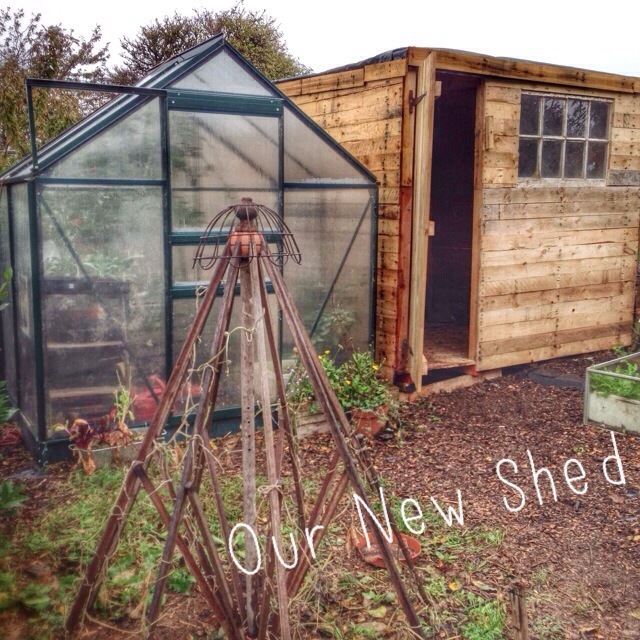 My brilliant allotment neighbour built me a 7’x8′ shed out of pallets (for a very reasonable fee) – it even has a reclaimed window in it to offer some light during the darker months. 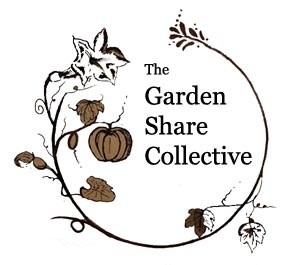 I have always felt that the allotment should be a place where we reuse and recycle and it really pleases me to know that the shed is constructed from such materials – I think we’ll continue that theme when insulating and decorating it. 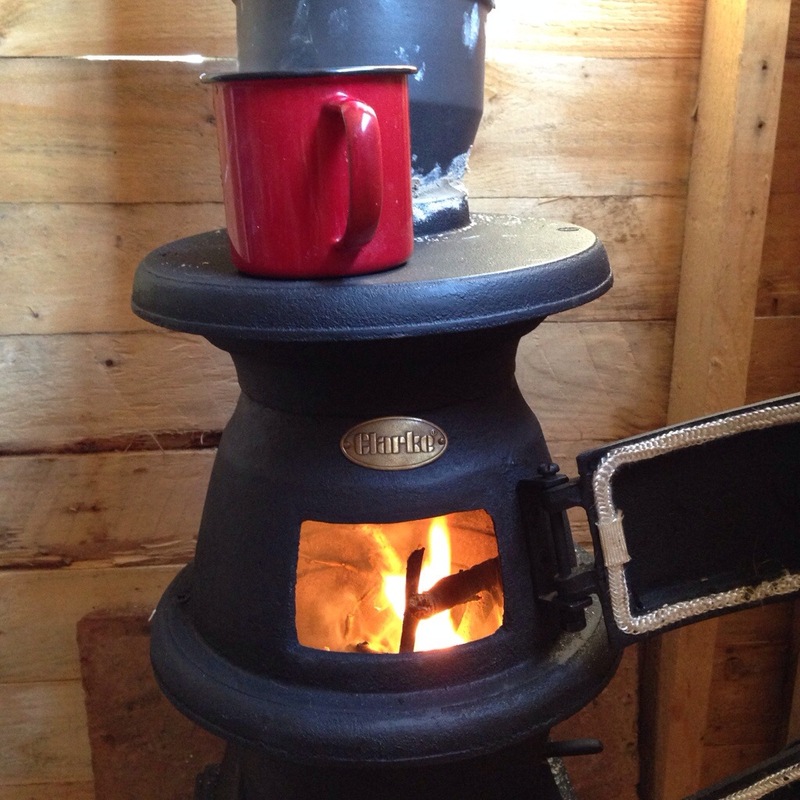 My other allotment neighbour persuaded us that we should also invest in a little wood burning stove for the shed. It’s a bit of an expense; but one thing I’ve learnt over six years of having an allotment and a family, is that if your children are happy and comfortable at the plot, then it means you can get lots done on your visits. Also, I find the allotment the place where I can relax the most, and I’ve been dreading not being able to visit due to the weather. Having the stove and a snug shed should help me to continue to enjoy the peace if he plot – whatever the weather and life throws at me. Sometimes when watching TV it’s what the producers don’t intend you to focus on that’s the part that sticks. 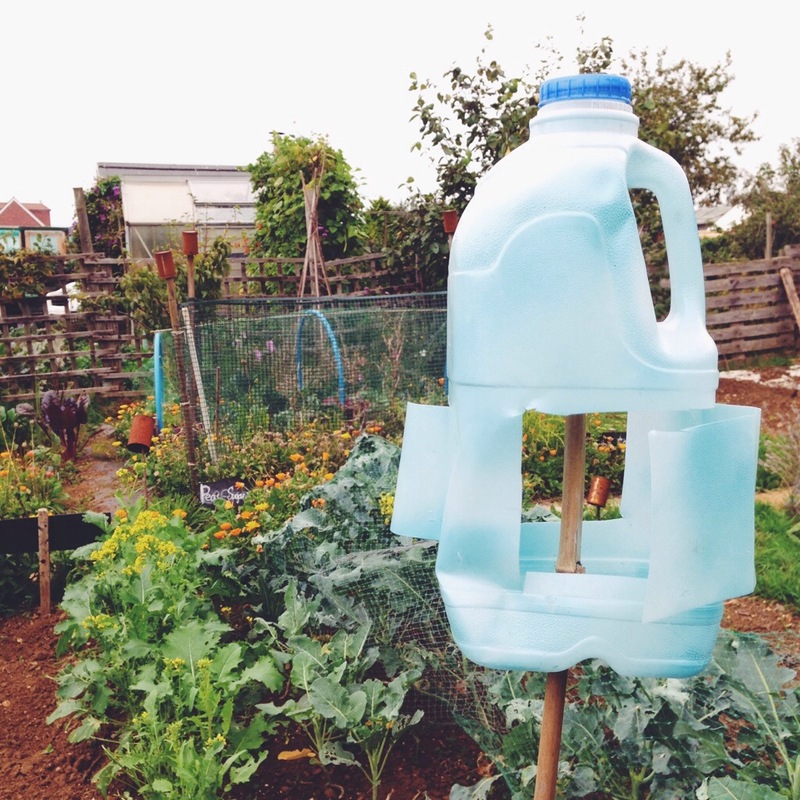 Watching Gardener’s World last week, I noticed a great reuse of plastic milk bottles. Like many of us with families we get through our fair share of the 2l bottles, and although we recycle them, I always think that there must be a good way to reuse them. At the plot we also have a problem with pigeons taking a liking to our brassicas, causing a serious dent in the rows of Cime di Rapa and Kale. So the chance viewing of wind operated bottle bird scarer got me thinking. Armed with a quick sketch from the TV screen I set about recreating them with our own pile of leftover bottles. First you will need to make a hole in the middle of the base of the bottle. It needs to be slightly larger than the diameter of the stick or cane, so that it can spin around. The cutting of the flaps is the most crucial step (and one I got wrong repeatedly before finally succeeding). The flaps need to be cut so that they go around the edges of the bottle (this allows the wind to catch them better and turn the bottle). They also need to be cut so both flaps encourage the bottle to turn the same way (see the image above). Once the flaps are cut, fold back and out to maximise the cup size, and then place the whole bottle on the bamboo cane. I decided to lightly spray paint mine with the leftovers of some enamel paint, but other than that, that’s it. So far the winds haven’t been too strong and the bird scarers have been gentle rotating, but as the winds get up during the autumn they should keep the pigeons away from my Cime di Rapa and other brassicas. What to do with a spare wellie? Having small children we have inevitably have a supply of old small Wellington boots. What is it with children and wellies? Or perhaps it’s just my children? Every time we buy a pair of wellies we try to buy a decent pair, so they don’t wear out. Then inevitably they do just that, or the children’s feet grow! Anyway, this leaves us with a fare share of wellies to recycle. What to do with them? 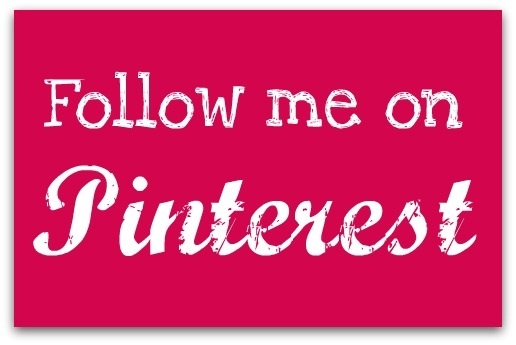 Well, one use I’ve come up with is to use them as planters. First you need to drill drainage holes through the soles of the wellingtons. Then put some polystyrene or other crocs in the bottom to help with drainage. Fill the boots with compost and then plant your plants in the top. I’ve planted nasturtiums and marigolds this year. They need a good water and will need to be regularly watered, like all containers. But they’ll do fine! 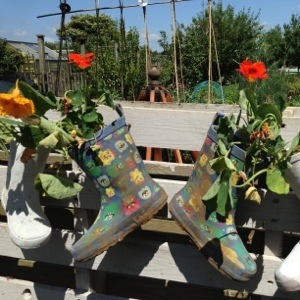 To liven up the fence at the plot I hung the wellies on the fence panels using cup hooks. It’s always nice to be met by flowers as we enter the plot. On a walk back from the school run one day I noticed someone had thrown out a wooden parasol. It got my attention, but I had no use for a broken sun shade. 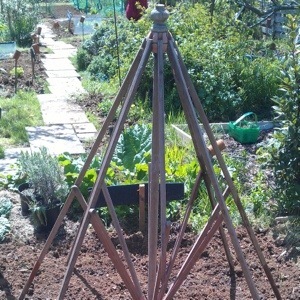 A trawl later through Pinterest (it was wet) led me to a photo of a cucumber frame made from an old parasol. Ever keen to reuse rather than recycle I returned from next morning’s school run with a broken parasol and hot-footed it over to the plot. 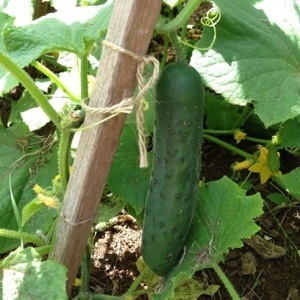 A quarter of an hour later the allotment had its very own cucumber frame! No cucumbers, but a great piece of reclaimed garden architecture. Fired up by cucumber enthusiasm I bought seeds, sowed and raised plants to populate frame. The standard parasol has eight spurs and so I duly planted eight cucumber plants. 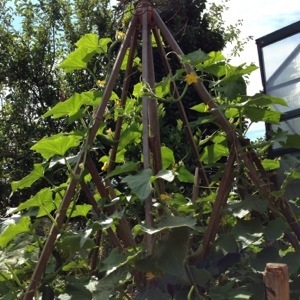 After a few weeks the plants started to ramble up the wood and I repeatedly tied them to the spurs to tame the evergrowing eight armed cucumber monster! Eight cucumber plants produce a lot of cucumbers and nearly everyone we know now has an almost unlimited supply if cucumbers. Now to investigate cucumber recipes as there seems no end to the supply – and I’ve got another plant growing in the greenhouse!